The season of Christmas in San Miguel de Allende is a time of joy and color, noisy fireworks and solemn religious services, music everywhere, and traditional crecimiento nativity scenes. Three Kings stroll the streets alongside the newer Santas imported from north of the border. A giant Christmas tree adorns the Jardín, its hundreds of lights coloring the cobblestones of the street. Piñatas hang in windows, and bright red poinsettias—called "noche buena" in Spanish—line window ledges and doorways. 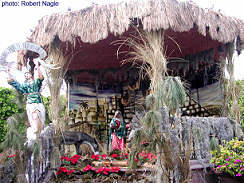 A huge crecimiento is set up in the Jardín every year, with life-size figures and live barnyard animals. The baby Jesus is put into his manger on Noche Buena, Christmas Eve. There are special holiday events just about every day for the two weeks or so before Christmas. Here's a list of official events for Christmas in San Miguel for 2009. NOTE: The Posada dates and times below are for 2009. Always double check starting times locally as they can vary by as much a 2-3 hours. Times are generally posted in the Jardín. Also check for updates and additions. More concerts and free performances in the Jardín are sure to be added. Daily - Christmas Fair at Plaza Cívica, selling plants, flowers, Christmas trees, decorations etc. Thursday, December 17 - 7 pm - 2nd posada begins at La Salud Church and ends at Santa Ana Church in Insurgentes. Friday, December 18 - 7 pm - 3rd posada begins at Santa Ana Church in Insurgentes. There is generally a special posada at the Biblioteca Pública before this. Saturday, December 19 - 7 pm - 4th Posada begins at San Antonio Church, in Colonia San Antonio, and ends at the San Francisco Church. Sunday, December 20 - 7 pm - 5th Posada begins at San Francisco Church and ends at San Juan de Dios Church. Monday, December 21 - 7 pm - 6th Posada leaves from San Juan de Dios Church and ends at the Oratorio Church. Tuesday, December 22 - 7 pm - 7th Posada leaves from the Oratorio Church and ends at the arches at Colonia Aurora. Wednesday, December 23 - 7 pm - 8th Posada begins in Calzada Aurora and ends at Las Monjas Church. Thursday, December 24 - 8 pm - 9th and final Posada of the season begins at Las Monjas Church and ends at the Parroquia. Christmas Eve and Christmas Day in Mexico are days to be with family. The streets will be deserted for much of the day and most restaurants will be closed for Christmas in San Miguel. For the few that remain open, it's important to make reservations in advance. Most hotel restaurants, such as La Puertecita, Casa de Sierra Nevada, Villa Rivera, etc. will be open. Other restaurants said to be open that day include La Capilla, El Buen Cafe (special Christmas buffet), Casa Luna (special Christmas buffet) and El Campanario. Some restaurants will open later in the day than usual. Check ahead!